Posted on February 14, 2015 by michellemorton Tagged CandycardsChocolatesHallmark HolidayValentine's Day	CommentsNo Comments on What does Valentine’s Day mean to me? What does Valentine’s Day mean to me? I don’t believe that this is just another Hallmark Holiday. I believe we have holidays like this to make us stop from our busy stressed out lives and make a point of letting someone know you love them. In my opinion or just my two sense as I say, Valentine’s Day does not have to be all about couples. It should be a day to let someone you know that you care about them. I am not a material person so I do not get caught up in the “gifts” that surround this day because to me they do not represent what love is. Showing your love does not come in a box of chocolate or from a jewelry store. Love comes from actions. It is being with someone. Doing something nice for someone. It is always being there through the good AND the bad. Valentine’s Day for me is a time for my family to show each other that we love each other. You see cards are not my thing either. I would prefer to get a hand written note. Why? because, well when I was going through a divorce many many years ago you see the person whom I was married to had gotten me this beautiful birthday card (my birthday is in June) and then just two short months later he left me. So, I realized after my first marriage that my marriage was based on material things. Things that meant nothing. On the outside looking in you could say it was “ideal” As in, I got flowers for everything! I got jewelry for everything! You get the idea…I was given all sorts of “things” over the years but what I was really missing was a marriage. We did not have that. So when I met my current husband, I knew from the start that I wanted my relationship with him to be different. To be real. To be void of the material things. I felt that I was given all those nice things out of obligation, not because they meant something to him to give them to me. So when I realized my husband was simple, and real and wanted the same things well I knew I had found true love! He used to send me letters when we were dating, he would write me messages in the bathroom after taking a shower by writing it on the mirror for me when I woke up and yes, this was AFTER we were married and had children. We would write our own Valentine’s to each other. We wrote our own anniversary letters to each other. In fact I have one of the notes he wrote me on my desk. It stays there every day so I can look at it and remind myself of the good during the bad days. And with my boys, well I started the note tradition with them as well. Yes, I am the mom who not only writes love letters to her husband but I write them to my sons. I also have my sons write each other Valentine’s, birthday cards, cards of encouragement. I have shown them to use their own words. I want them to learn to express themselves because well with boys it is hard. I want them to learn to appreciate each other. We do not take them to the store to buy cards – they make their own cards on construction paper. I don’t care what they say, or what they make. That has always been my thing. It just has to be their words. I honestly did not realize what I was truly doing with them and the bond that I was creating between until recently. All the seeds that I have planted (not in all areas haha) and have been watering are growing on their own! Now, would they sit down and write each other notes all on their own? no! Do they think it is a little silly? yes. I don’t care though. When they move out and are on their own well then they can go buy a cheesy card but for now I am teaching them something far greater than they could ever buy in a store. And the best part is saving these letters! They are the best thing to go back and read! I love getting out their memory boxes and reading them. They are such a treasured gift. So on Valentine’s Day don’t focus on what the media says today should be. Make it about what you want it to be. If you fall to the hype then yes, it is just another Hallmark Holiday in my opinion. Choose to share your love with someone who may need you. There are so many things to make today about “love” instead of “things”. So that is just my two sense but it is from my heart! Welcome to my first blog post from the “other side of the fence.” I thought this would be a fun place to share my experiences as a sports mom and sometimes as the Coach’s wife. I have the privilege of raising three amazing boys ages 19, 15 and 11 with my awesome hubby. Each one has played flag football, tackle football, basketball, baseball, and soccer. My youngest two currently play baseball for their school team, a travel league, and a showcase team. It’s ironic that I am a sports mom because I do not like sports. But I do love watching anything my boys are involved in so I enjoy watching sports when they are playing. We have always started them out in rec leagues. My husband is a sports guy. He played sports in high school and played college baseball. He has coached high school, to rec leagues to travel ball and has coached a lot of our sons’ teams as well. When it comes to making sports decisions, I have always followed his lead. Don’t get me wrong, I do share my opinion. We are always being asked how we do what we do! What I share is not expert advice. I am by no means an expert, well maybe at cleaning baseball pants! So I would like to share our family belief system when it comes to sports. I think it is important for a sports family to have a set of rules that you share with your children. This is a great way for you to share with them your expectations and also let them know you are there to support them as well. Choose your sport. We do not choose for them. We do not tell them what sport to play. One sport per season. We only let them play one sport per season. Sometimes there has been an overlap because of one season ending and another one starting. Downtime is important too. We also believe that it is important for them to have down time as well. We want them to just be a kid for as long as they can. No travel teams until middle school. We have always steered away from travel teams until middle school age. That is until our youngest started playing his last year of elementary school. We chose this path because he was showing a strong interest in playing a higher level and had the maturity to handle it. Many travel teams can be very cut throat and a win at all costs attitude. This is not necessary at this age and we picked a team that met our philosophy. Development of the player is paramount in our opinion. We made sure there was a limit to the numbers of games that would be played during the season and that the coaching of fundamentals was going to be stressed at the practices. Too many games and little or no development of the player are show stoppers for us. We are investing time and money into this journey and want to make sure there is a benefit to that. No showcase team until high school. Once they get to High School and they want to take it to the next level, playing on a showcase team is an option. We feel that if playing more competitively is something that they want to do and the boys demonstrate the ability to perform at a higher level, then we are willing to support that. It is also very important that player development is continued at this level as well. We do not believe in the philosophy that you just show up and play. If there are not structured practices that emphasize player development, to us even showcase baseball is a waste of time and money. Respect the coaches. We have taught our boys to respect their coaches on and off the field. It is important to teach your children that your coach is the one who makes decisions. I know that it is hard sometimes for parents as we find ourselves coaching from the stands or coaching them when they get in the car on the drive home. Teaching your children to listen to their coaches, even if you may not agree, is very important as they need to learn to respect the coaches decision. When they are on a team everyone needs to work together. It is also important not to criticize the coach in front of your child or let your child know that you did not like the coach’s decision. Your child becomes can become confused and they are not sure if they should listen to you or their coach. You want your child to be “coachable”. This is something that will fare them well as they advance in their journey. I can remember a time when we were nervous for one of our son’s as he was trying out for a new team. We were not worried so much about his ability, because we take the stance that if the coach decides he is not a good fit for the team, then we have to respect that. Being a new team, we weren’t really sure what they coaches were looking for in respect to personalities. When the coaches told us that he had a good try out, that he worked hard, and he listened to what was asked of him, we were pleased to hear this. Have a good attitude. We have taught them that it is ok to be upset over a mistake, but it is not ok to throw equipment and pout about it. Attitude has just as much power as skill. Learn to lose. You have to learn to lose in order to win! This is not an easy one because no one likes to lose. We say this only because of experience with our oldest son. When he first started out his high school career he started out with a brand new high school, which meant a whole new baseball program with only freshman and sophomores. Not an easy position to be in and let’s just say they definitely lost more than they won. We watched our son grow so much from this experience. He was a left handed pitcher and he was brought up on the Varsity team as a freshman to pitch for them. You could see the fear in his face. There is a big difference in a freshman versus junior and senior and he would get out on the mound and as he looked to the plate there stood “big ben” so to speak from his perspective. My son was also one of the smaller guys on the team, so he was intimidated by their size. He spent his freshman year working through all of that, because he soon realized that if he was going to have success on the mound he needed to just get out there and pitch. I can remember a game where he pitched against Carlos Rodon (Former North Carolina State star pitcher and #3 overall pick in the 2014 MLB Amatuer Draft)! Carlos was a senior and our son was a little freshman. Well Carlos hit a home run so far we joke all the time with him that we are still waiting for the ball to come back down to earth. At the time my son did not think it was cool, but now seeing what Carlos Rodon has accomplished it is pretty cool experience. It was hard for him to keep losing game after game that year, but he continued to give it his all. By his sophomore year he was on top and had worked through all of that self-doubt and he was chosen as rookie of the year for his conference. Yes, his ability was there but I can tell you the fact that he had to learn to dig deep and not give in to the “losses” is what taught him how to be a true winner! My son has always pitched with passion and everyone loves watching his energy on the field and that to us is success. Bill and I see the value of sports beyond athleticism. Working hard, being a good sport, being a good loser—all valuable skills in life. We want to see each of them grow as a person just as much as getting better at their sport. See YOU on the other side of the fence! 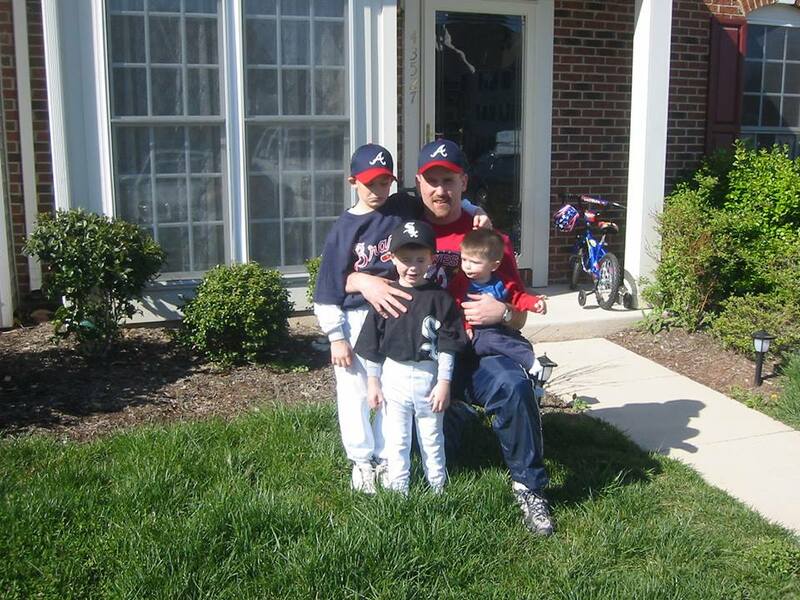 PS – This picture is from when my guys were little and the older two were already playing ball with Dad as the coach! Posted on February 9, 2015 by michellemorton Tagged ComparedeclutterNormalOrganize	CommentsNo Comments on YOU are normal! The past couple of days I helped a mom delcutter some areas in her home. These areas are some of the hardest to tame because they are used daily by multiple people (pantry, laundry room, and the bonus room) During this time I was reminded of something that I have noticed over the years when working with clients and honestly I have even heard comments like this from friends, “I bet you don’t have messy closets like this” “I bet you don’t save things like this” “Have you ever helped someone like me?” “I bet you don’t shop at Target” These comments don’t hurt my feelings they only make me realize just how hard we are on ourselves. Myself included. I did not start a professional organizing business because I have all the answers. I started my business because I wanted to help others live with less clutter. It does not mean that I don’t have clutter and yes, I shop at Target. What I have learned over the years from you and from my own experience is that we are always comparing our lives, our bodies, our homes, and so on and so forth. I believe that we do these things because we just want to know that we are “normal”. 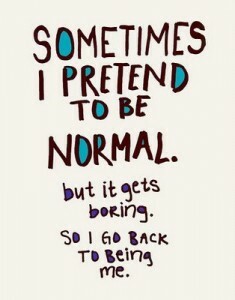 What is “normal” though? When we start questioning “Am I normal” “Is this normal”. We often feel like no one understands and no else has problems. Do you ever find yourself feeling like this? Well I don’t know what “normal” is because my “normal” is not your “normal.” What I do know is that if we all focused on ourselves and what we can control, I think we all would have a lot less stress. What I can tell you is that your neighbor that you’ve been wondering if her closets are yours? The answer is does it matter? Don’t compare yourself to anyone but YOU! Change the things you can change. Work on the things that are going to make a difference in YOUR life. Don’t worry about someone else’s “normal.” Their “normal” may not be as good as your “normal.” Remember: the grass is NOT always greener. It is only green where you water it. Imagine if we stopped judging. Stopped assuming. Stopped comparing. Posted on December 16, 2014 by michellemorton CommentsNo Comments on Saying no to guilt, gift giving, clutter and saying yes to more time and money! Saying no to guilt, gift giving, clutter and saying yes to more time and money! It’s such a busy time of year! Our already over flowing to-do lists grow and grow this time of year. Are we doing it to ourselves? Do we really “have” to do it all? I say,no! Are you buying out of guilt or are you buying for the right reasons? Do you find yourself buying something for someone just to give them a gift because that is what you are “supposed’ to do? Or is there meaning behind the gift? I think we can all agree that we all love to buy and receive gifts. The million dollar question is what is all this gift giving costing us? Can you really afford to? If you find yourself going into debt or having to cut back on your own family gifts then maybe it is time to cut back on purchasing gifts for others. You will be saving time and money. If you feel that you must do something, then invite that person over for coffee, tea or dessert – it doesn’t have to be a meal but just getting together to visit has more meaning than something you could ever buy. If you are just buying to buy then there is a chance that you are purchasing clutter! If that person does not need the item you are gifting to them then it becomes clutter. Some people have a hard time letting go of things because someone gave it to them. You could always bake cookies or bread, gift wrap it and give that to them instead. Learn to say no! Take a look at your list and see what tasks you can remove. There is always something you can find that you think you “have” to do that you really don’t. Try and focus on those tasks that have meaning and bring you happiness. Saying no to a few things here and there can have a big impact. Saying no is not easy, which is why I suggest trying it out on your to do list first. Then each year cut back a little more and in doing so you will find that it gets easier to say no. By saying no to other things you are saying yes to yourself! Posted on October 15, 2014 by michellemorton CommentsNo Comments on Turn back your clock and change your filters! Turn back your clock and change your filters! As I continue to work on my fall cleaning/projects one of the items on my list is to change the air filters. It’s also that time of year when we turn our clocks back. I like to take time in the fall to get ready for the winter months. We have not had to turn on our heat yet but in the next couple of weeks I am sure we will. I always like to start out the new season (heating/cooling) with clean air filters. Yes, we change our filters more than just twice a year but during the change of seasons I like to do more than just change the filters. 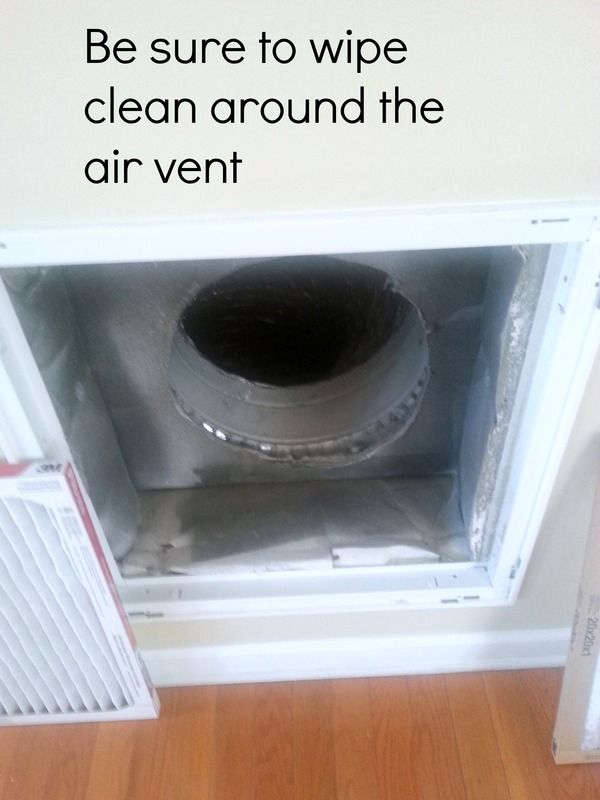 I take out the old filter (usually dirty and gross) I clean around the vents with hot water and cleaning rag, you can also use a vacuum. 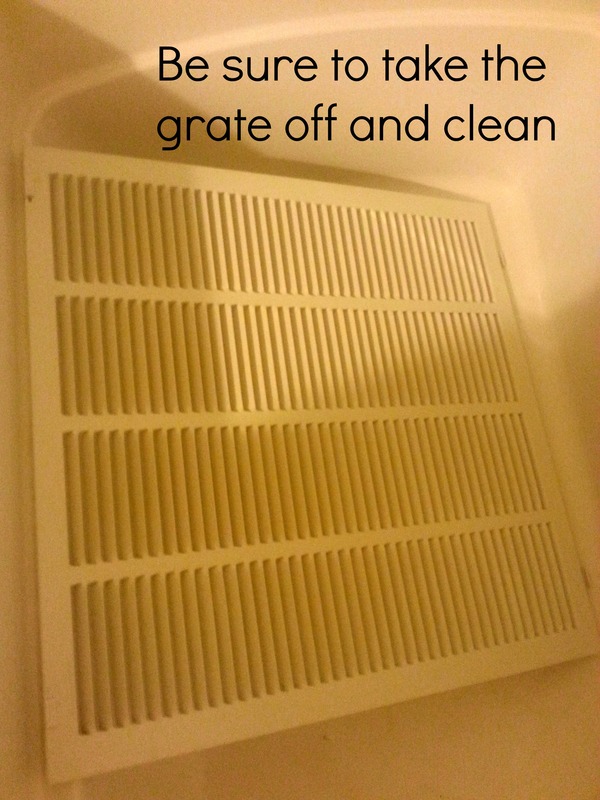 I take the grates off and clean those with hot water. I clean them in the bath tub as it makes it easy to run the hot water over them and clean them on both sides. Then I let them air dry. 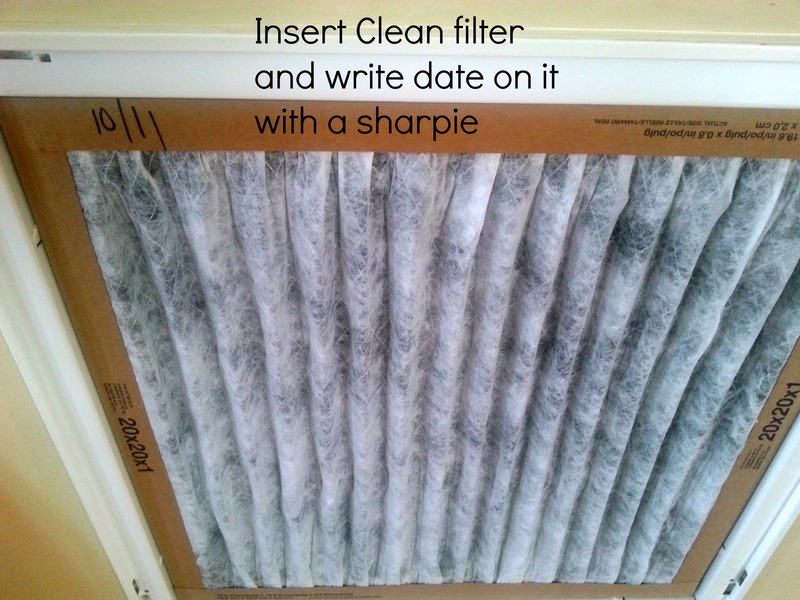 I take a sharpie and write the date on the new filter before placing it back in the vent area. I also like to make an appointment with myself to change the filters again. That appointment goes right in my calendar. I like to use an online calendar especially for appointments like this that are recurring so I don’t have to keep writing it. Thanks for following along with me. I know that this is not breaking news and nothing new, I just thought you might like to see how I keep up with cleaning and household projects all year-long. 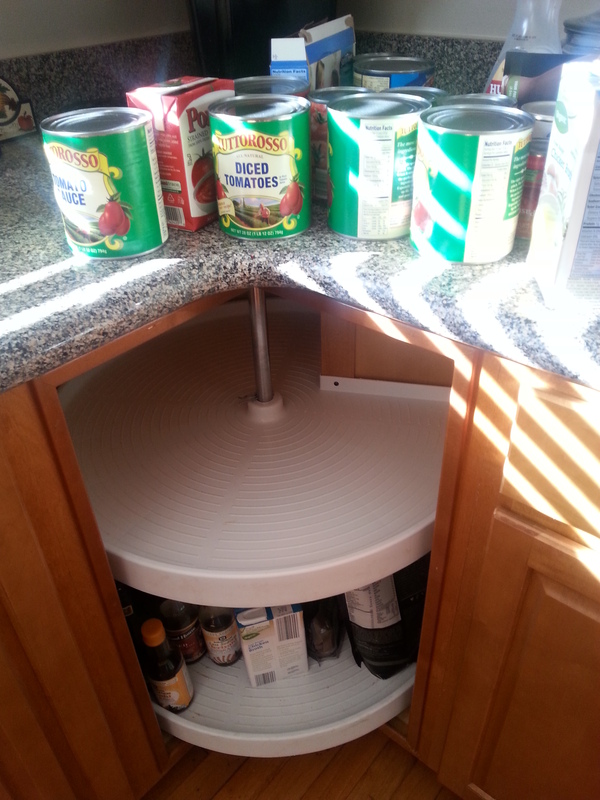 Posted on October 13, 2014 by michellemorton CommentsNo Comments on It was a lazy susan kind of morning! It was a lazy susan kind of morning! Do you ever find yourself sidetracked with impromptu cleanings? I know I do! 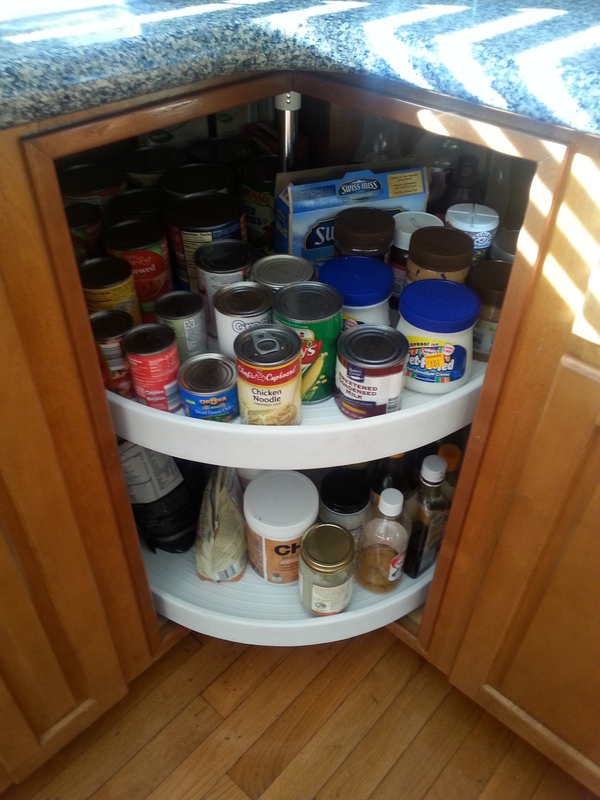 It all started when I was looking for something and realized that something had spilled on the lazy susan. Question is what is it? 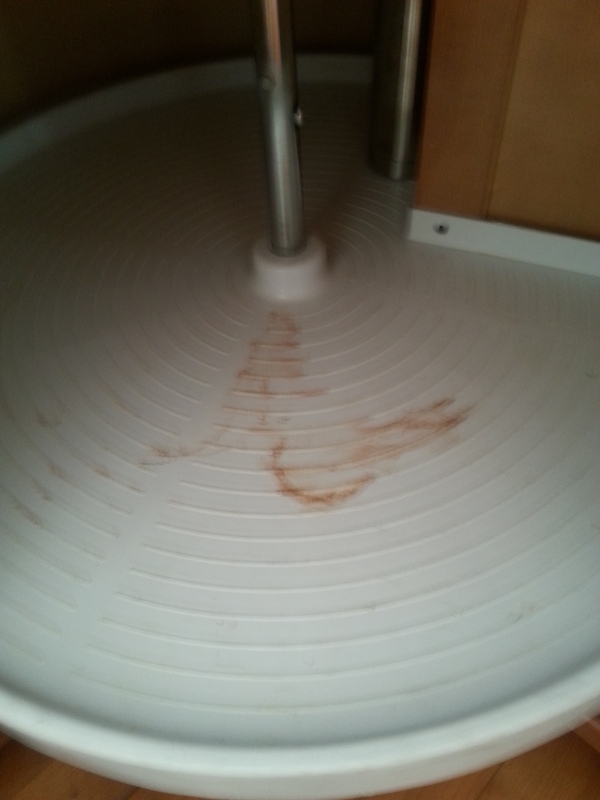 (I am not into taste testing) and who did it? Well, that is the million dollar question followed by “why wouldn’t they clean it up?” There is a possibility no one including myself knew they spilled something. So I found myself cleaning the lazy susan. I started by taking everything off so that I could wipe it all clean! After it was cleaned and wiped dry, it was time to put everything back (now this is a great time to look for “expired” foods to throw away or if you see any food items that you have duplicates of or that you know you are not going to use, this is a great time to start a collection (just get a paper bag or box of some sort for items that you collect) and then donate to a food drive or to a local pantry. Maybe this will inspire you to clean your lazy susan or a cupboard or two! Please follow along with me as I conquer my fall projects! I would love it if you would share your projects or impromptu cleanings with me! Posted on September 22, 2014 by michellemorton Tagged Hurricane HugoMyrtle Beach	CommentsNo Comments on Remembering Hurricane Hugo 25 years later! Remembering Hurricane Hugo 25 years later! I saw this article http://www.newsobserver.com/2014/09/18/4161127_hugo-hit-25-years-ago.html?rh=1 posted on facebook by a friend and immediately said “Wow, I can’t believe it has been 25 years” and then I found myself thinking about my experience with my first Hurricane. Twenty-five years ago I had moved to South Carolina with my boyfriend and his brother. I grew up in upstate New York, as in the Adirondacks. Where it is cold more months than it is warm. Lots of snow, but no hurricanes. We had moved to South Carolina so we could attend Francis Marion University located in Florence, SC. I lived with room mates and my boyfriend and his brother lived right on Myrtle Beach. We had not lived there long when I realized it was the wrong move for me (little did I know it had more to do with the boyfriend than it did where I was living) I called my Mom to tell her that I was coming back home. She made plans to fly down and then we would drive back together. Shortly after her plans were made, we heard chatter about a hurricane coming. As the days counted down and the hurricane was gaining strength, it was time for her arrival. She was arriving the same day Hugo was expected to make landfall. She insisted on coming. If you know my Mom then you know she was not about to let her daughter experience a hurricane in a strange place with no family. There was no talking her out of it. I remember that morning. We had been preparing and getting things packed up when we received a knock on the door that there was a mandatory evacuation. We had minutes to get whatever we were taking and get out. As we were packing up our vehicles, I remember the wind was blowing so hard that it made it hard to open the doors. We had no idea where we were going to go, we just knew that we had to start driving. All the while my Mom’s flight took off and she was on her way. Trying to get anywhere was a nightmare. Traffic was an understatement. It was creeping at it’s best and I was driving a stick shift to boot. It was hot for a northern girl. And remember, there were no cell phones. I had to make stops every now and again to find a pay phone to check in with my Father & Grandmother as my Mom would do the same. That is how we relayed messages back and forth. The more we drove the more we realized that Hugo’s path was following us. It felt like we were being chased. I was starting to feel like I was not going to see my Mom. The airports were closing, we were driving all over the state to find a safe place to stay along with everyone else. My Mom was coming no matter what, even if that meant her flying the plane herself!We finally met up with my mom around dinner time. I was so relieved to see her! I was very worried about her safety as she was mine. With mom in tow we spent the next few hours driving more until we were finally able to find a school that was serving as a shelter. We were off the road by the time Hugo hit. I will never forget the sounds I heard. We all tried to remain calm waiting for Hugo to leave. I can only imagine what my family must have been feeling back home not knowing what was happening. It was not easy to find pay phones and make phone calls during a natural disaster. It was long distance so most of the calls were made “collect”. Does anyone remember that term? I am sure my parents won’t forget it after they got the phone bill the next month. We spent the next few days at the shelter. Where my boyfriend and brother were staying they were not able to return for a while as there was alot of damage. I remember the pool looking like a sardine can that had been rolled up. Once the roads were opened up as best as could be and my boyfriend and his brother were able to find a hotel to stay in temporarily, it was time for me to go back home. My mom and I set off for our long drive back to New York. I was very happy to go back home. It was not easy to have witnessed what others had before them. You wanted to be able to help everyone. If you have never seen what a Hurricane does it can be mind blowing. I remember driving and we saw one house was totally fine and then the next house was just bits and pieces. There were boats in the roads. Homes were moved from their location to a new location. I could spend all day writing about everything that we saw. I do wish that I had written in detail about my experience at the time as I think it would be great to go back and read all the little things that as time has gone on I may not remember. Hurricane Hugo did not make me afraid to live in the south as I eventually moved back and have been living in the south for almost 15 years now. I have experienced driving through a tornado but have not had any more first hand experience with another hurricane. So, tell me, where were you during Hurricane Hugo and what was your experience?